From Tree, To Tip, To Trade Show! Over 260 pages! FOURTH EDITION! 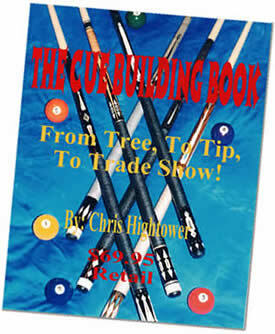 This is the most extensive book on cue building written to date. As the title suggests, it takes you through the complete cue building process from the sawmill, to the finished cue, to marketing your cues. It covers many things that the videos don’t. However, it is said that a picture is worth a thousand words. It covers doing work on wood lathes, metal lathes, and of course, cue lathes. It shows the table saw tapering machine, how to build your own spray booth, kiln, wood stabilizer dipping tank, collets, linen presses, inlay patterns and much more. It shows how to put on the finish with and without spraying, Irish linen and leather wraps, V-groove and butterfly points, inlays and much more. There is an “Advice from the Masters” chapter that gives advice to beginners from some of America’s most well known cue makers who have been building cues for decades. There is also a brief history on cue building in the USA. There is a suppliers list showing where to buy almost everything you need to build cues from shaft wood, to exotic woods and veneers, cue parts, manual and CNC machinery and small tooling. The book has nearly two hundred drawings, showing how to do the various operations and how to make the special jigs. It is a wealth of information contained in a format that is easy to read and refer back to. There is a section for your own notes in the back. Every beginner to intermediate cue maker should have this book and the advanced cue maker might still pick up some little tricks. turning butts and shafts from scratch with and without taper attachments and more. All the work is done on our Cue Smith Lathes. This video comes with a $50 credit toward the purchase a Cue Smith Lathe! Includes: Inlaying, Pattern Making, Veneers, Re-Cut, Full Splice and Butterfly Points and more. The work is done on our Cue Smith Lathe and Inlay Machine. This video comes with a $50 credit toward the purchase of a Cue Smith Inlay Machine! Cue Assembly, Boring, Coring, Tenons and More. Includes: Assembly, Boring, Coring, Indicator Readouts, Ring Work, Tenons, Threading and more! Re-Finishing , Carbide Sanding Mandrels, Brushing and Spraying Methods! Or you can call 770-684-7004 between 2 and 6pm eastern time with credit card. to cueman@cuesmith.com and we will send you a paypal total with USPS shipping rate. © 2004–2018 International Cuemakers Association. All Rights Reserved. No part of this site may be used in any form without written consent of the owner.